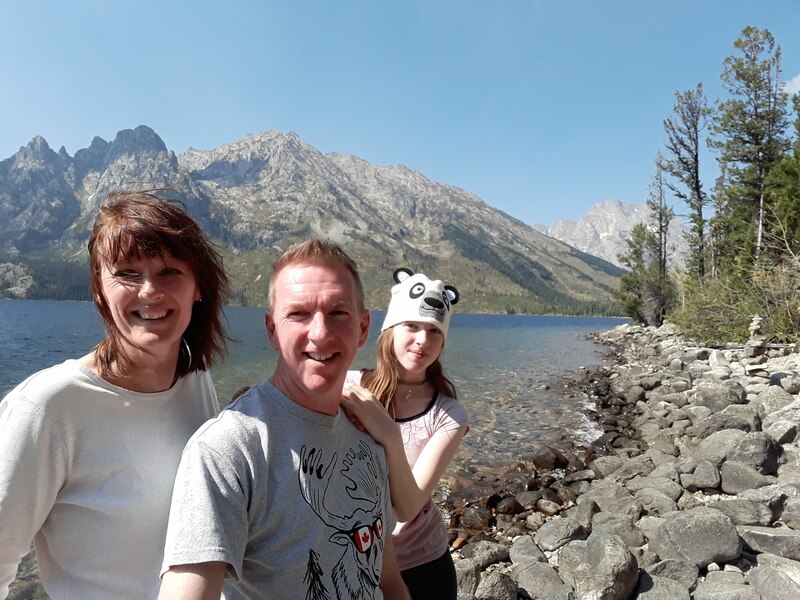 Yellowstone Park in Wyoming was on our bucket list for years before we eventually planned our family trip there in September 2018. It was somewhere that we’d only seen on documentaries and couldn’t wait to explore it for ourselves. But it can be a trip that comes with a few challenges. Yellowstone National Park can be difficult to get to, expensive to stay in and with so much to see there, what do you choose to do? 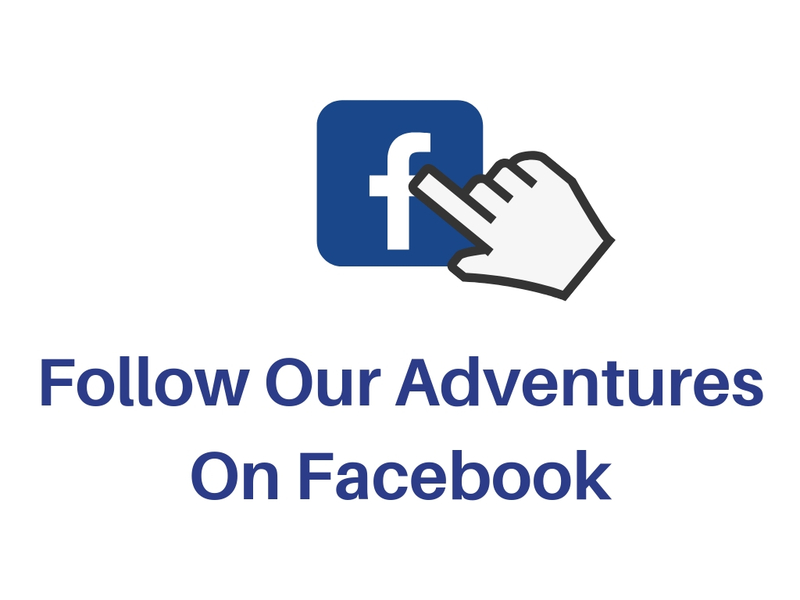 Below we’ll explain what we did and how we did it, to help you with planning a Yellowstone Park family adventure. 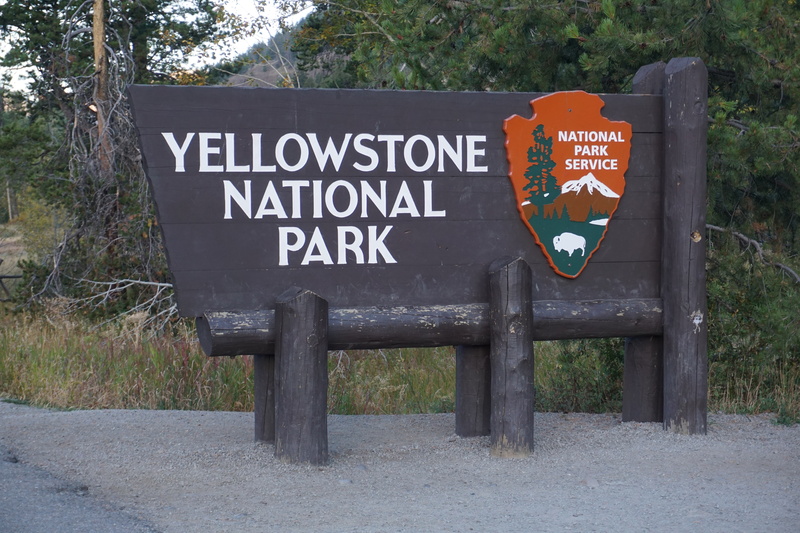 We visited Yellowstone National Park as part of a longer road trip that we had started in Seattle. Yellowstone was our main objective but we were aware that weather can play a big part in a visit so we played it by ear. Luckily we had lots of flexibility in our trip to allow for things that may come up. 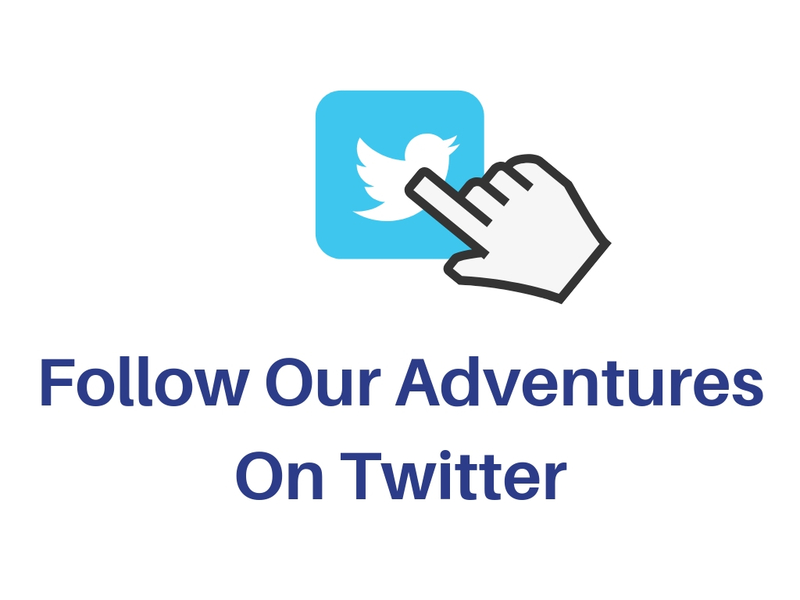 Because of our flexibility and doing the trip at short notice, we had nothing planned and no accommodation booked. 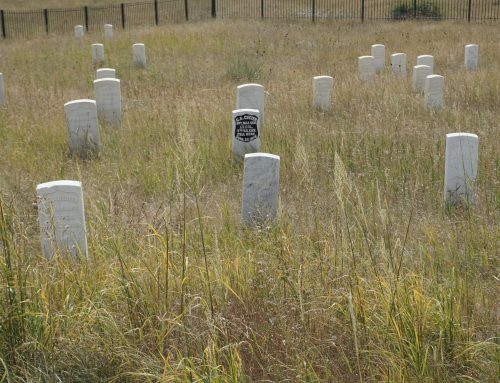 We hadn’t booked any accommodation so there was no way we’d be able to stay inside Yellowstone National Park. To be honest, even if we’d pre-planned this trip over a year in advance we still would have decided to stay outside of the park. The prices of the park lodges are high, very high. You have to weigh up and get a balance between the cost of the lodges and the cost of fuel to drive backwards and forwards between accommodation outside of the park. We like to stay flexible so it suits us to just wing it a little and grab somewhere to stay on the hoof but be aware that in high season, even places outside of the park, book up solid. Mid-September, when we visited, is nearly the end of the season so it’s easier to arrange somewhere to stay. Approaching Yellowstone from the East meant we would be travelling through Cody, which we really wanted to see anyway. 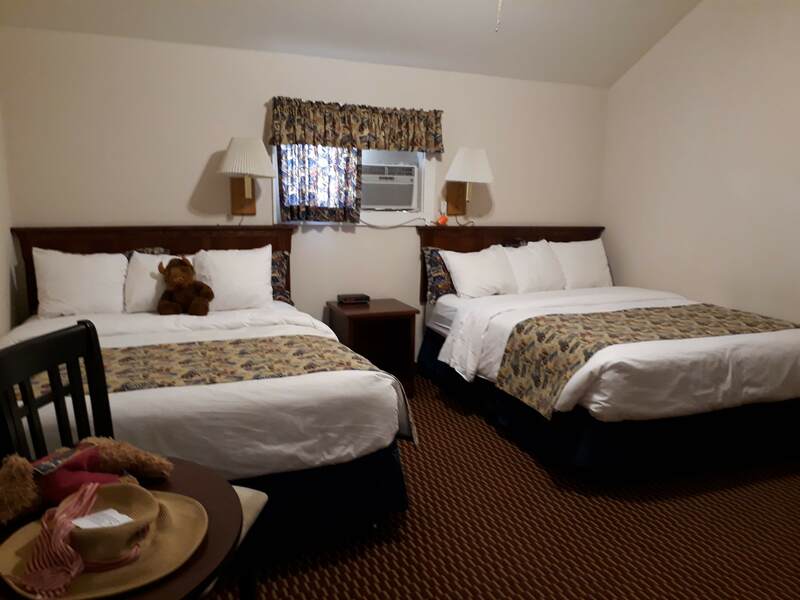 After looking at places to stay there ( Cody is the last town before the East entrance to the park ) we were offered a really great discount on a cabin at the Holiday Inn Buffalo Bill Village. The cabins are actually nicer than the main hotel and a lot cheaper. We loved our stay there in the cute, cosy cabin. So we thought three days would be enough for what we wanted to see in the park and actually we spent two and a half days. We pack a lot into our days, setting out to reach the park by sunrise and leaving at sunset. Below is a map of our route around the park and an itinerary of what we visited. Day One is the Blue route, Day Two the Purple route and Day Three the Red route. 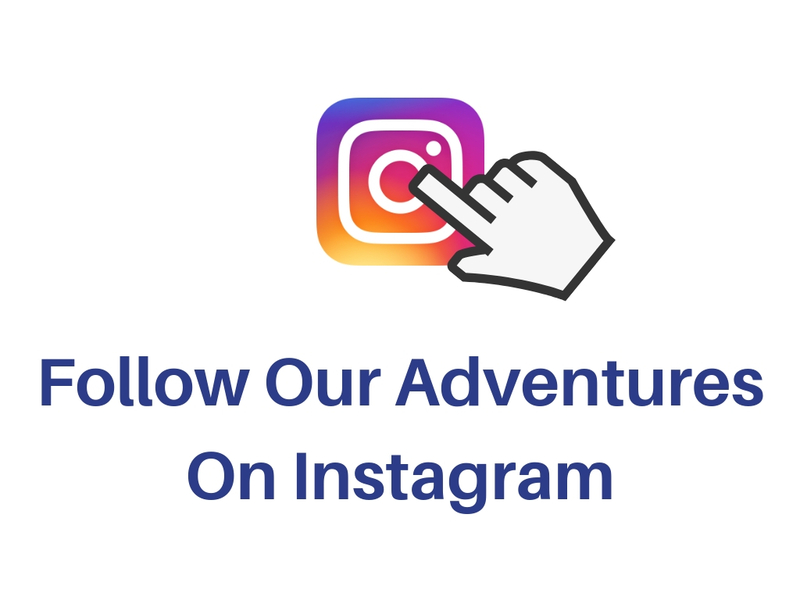 I’ll give a brief outline of what we did during our visit but you can read a more in-depth description here. Leaving Cody before sunrise we headed West towards the park entrance. This is the only road heading West, skirting the Buffalo Bill Reservoir and driving into the Shoshone National Forest. We kept our driving speed down as there is lots of wildlife in the area and we saw deer near the roadsides. 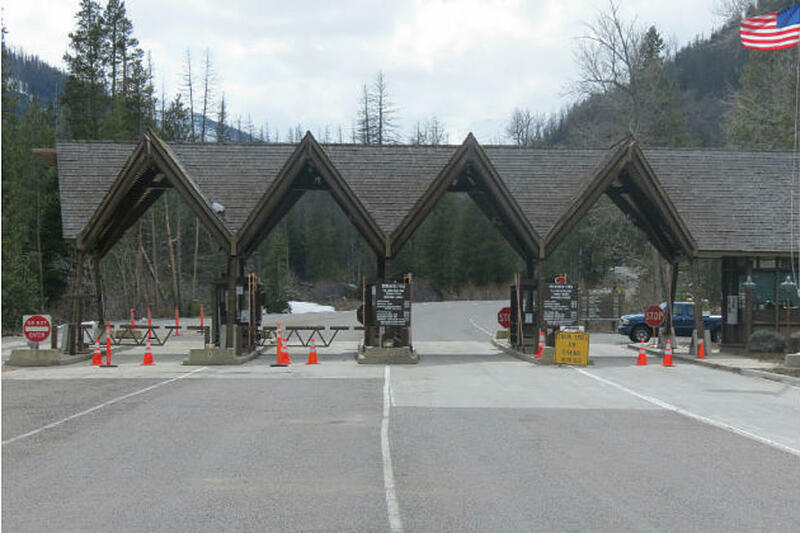 The road started to climb as it approaches the entrance kiosk where we paid our park fee. The road from the entrance winds its way through the forest then climbs along the mountainsides as it gets ever higher. 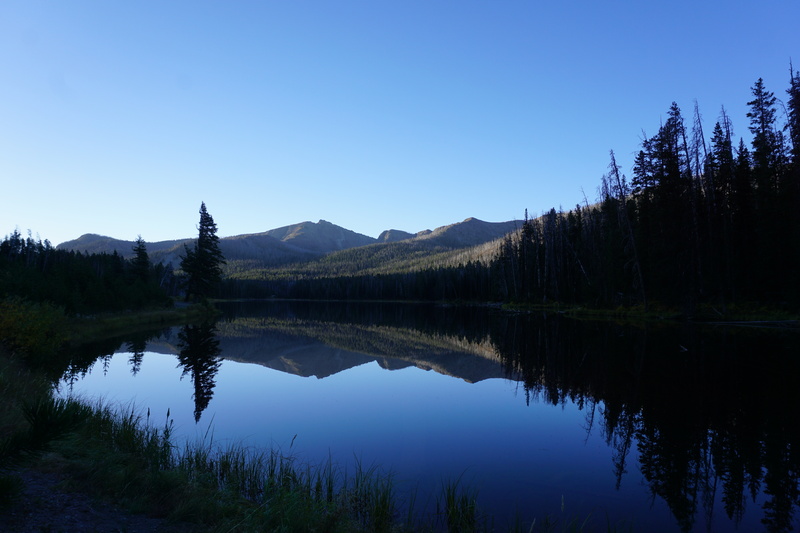 It’s a long climb up to Sylvan Pass where we stop for the wonderful view of Sylvan Lake in the morning light. From here the road descends through forest to the shores of Yellowstone Lake. Near to Yellowstone Lake, we get our first wildlife sighting and unexpectedly it’s a female Grizzly Bear foraging for food. There are quite a few people watching as the Grizzly rummages around in the undergrowth. We’re pretty stunned to have seen a Grizzly already so early on in our visit. 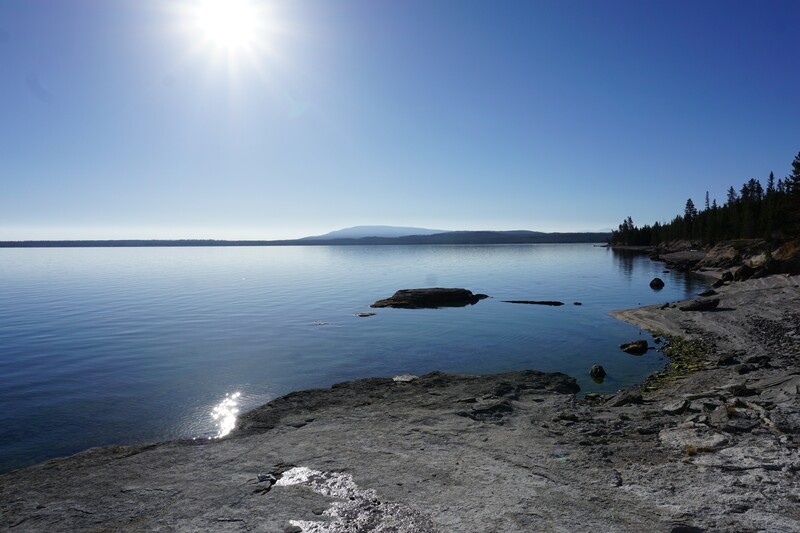 The road skirts Yellowstone Lake and joins the Grand Loop Road at Fishing Bridge. We turn right, headed North. 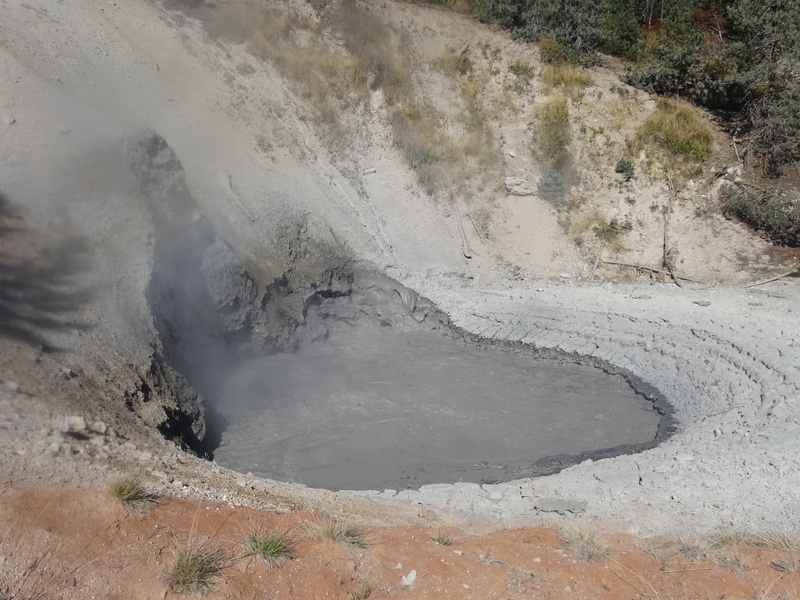 Driving North we find the parking area for the Mud Volcano and Sulphur Cauldron areas. 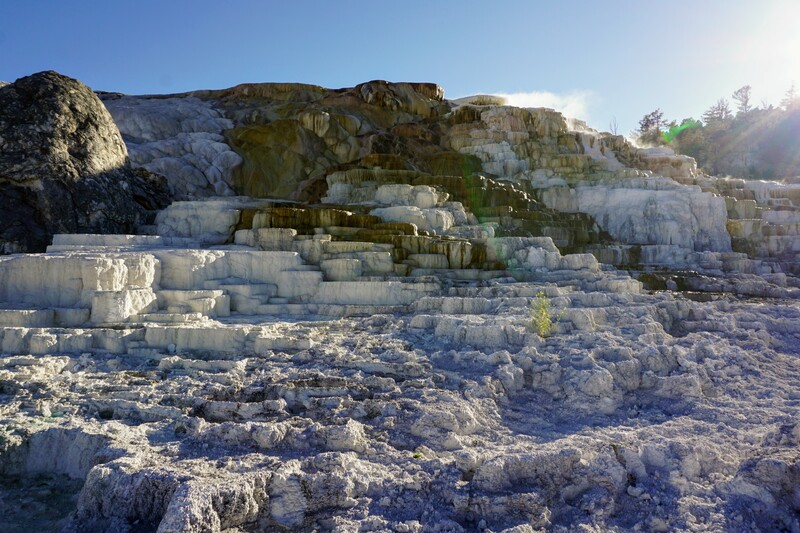 A trail takes you around the area of steaming vents and hot acidic springs. The smell of sulphur is pretty overpowering here so we head down the Yellowstone River for some fresh air. The road follows the Yellowstone River Northward until a spur road to the South Rim Drive and Artist Point. 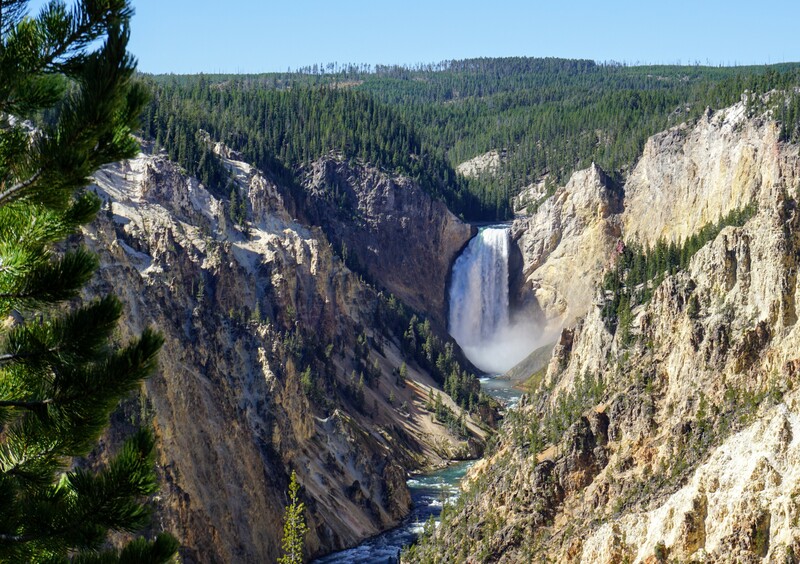 There are amazing views of the Upper and Lower Falls and the Grand Canyon of Yellowstone from here. We then drove to the North Rim Drive with more great views of the canyon below and waterfalls. 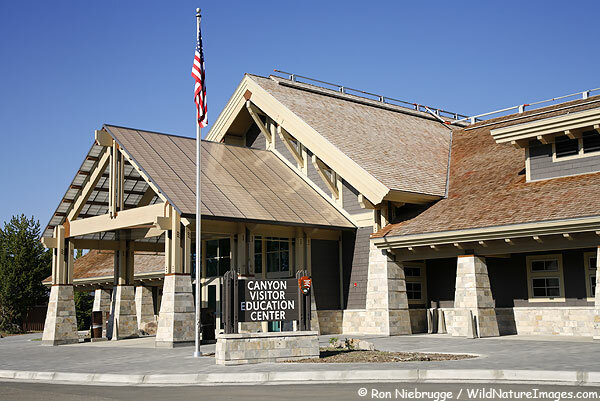 Canyon Village has lots of amenities including a hotel, information centre, general store and restaurants. We ate in the General Store burger joint. This is a long drive through beautiful scenery and we saw wildlife. 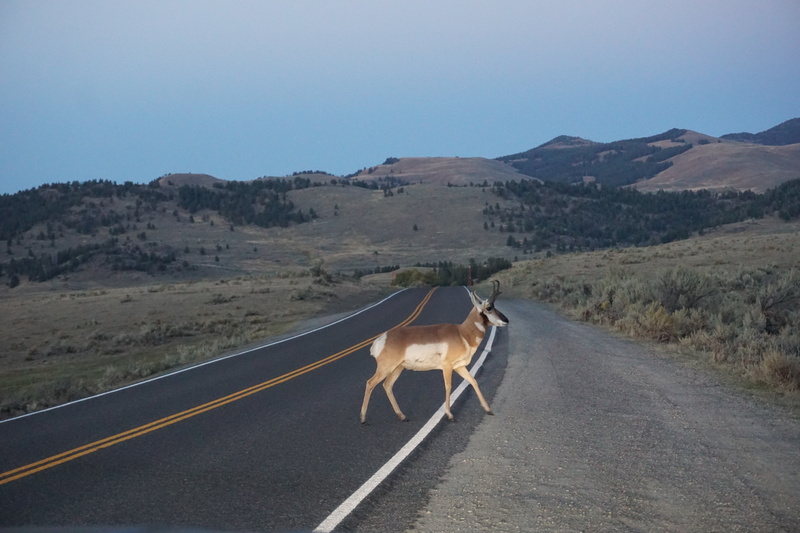 Expect wildlife to be on the road, including Elk, Goats and Bison. 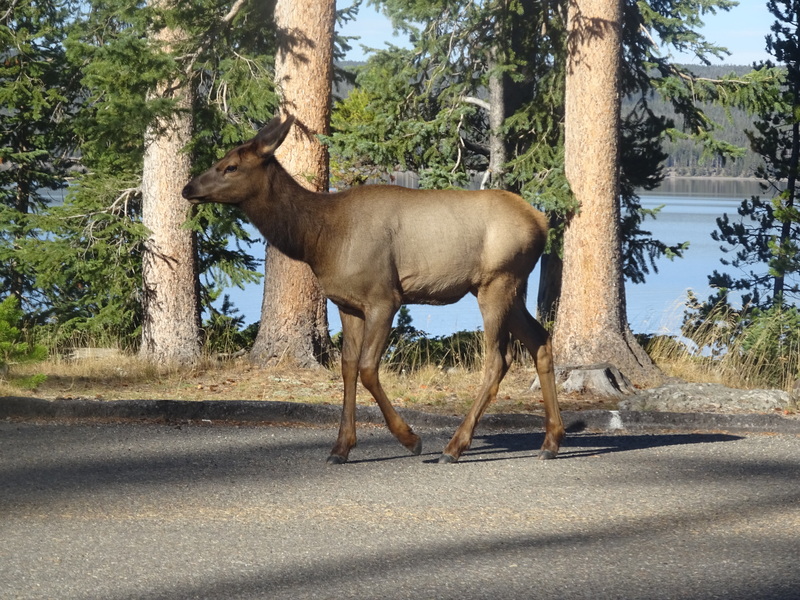 Arriving in Mammoth we were surprised to see a huge herd of Elk on the village green. A boardwalk takes you up and around the Hot Springs Terraces with their beautiful colouring. Backtracking we head East but join the road that takes you through the Lamar Valley and on to the North West Entrance. It was getting toward dusk as we drove through the valley. 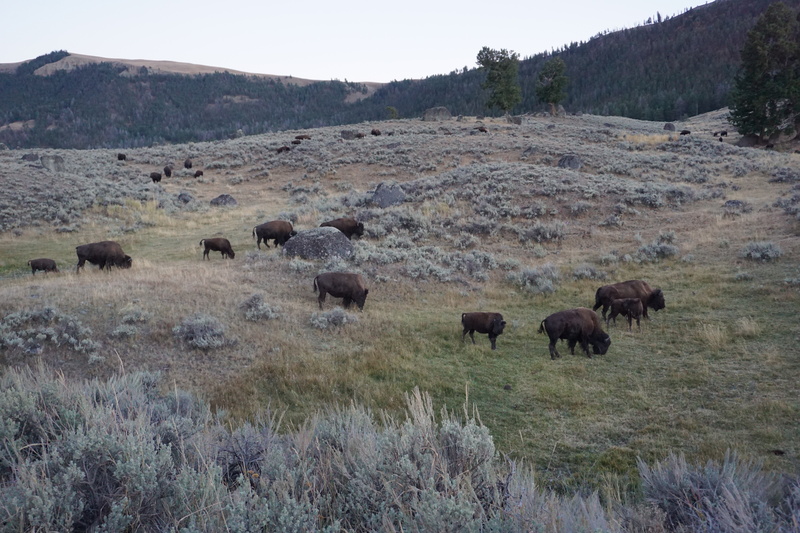 This is the place to see wildlife with herds of Buffalo and Pronghorn. Lots of Buffalo on the roads ( so be careful ). This was a very long drive, especially in the dark. We had to drive slowly as Buffalo and Deer were about. We made it back to Cody late evening, tired from a long day. Following the same route into the park before sunrise after grabbing fuel for the car and some snacks for us. 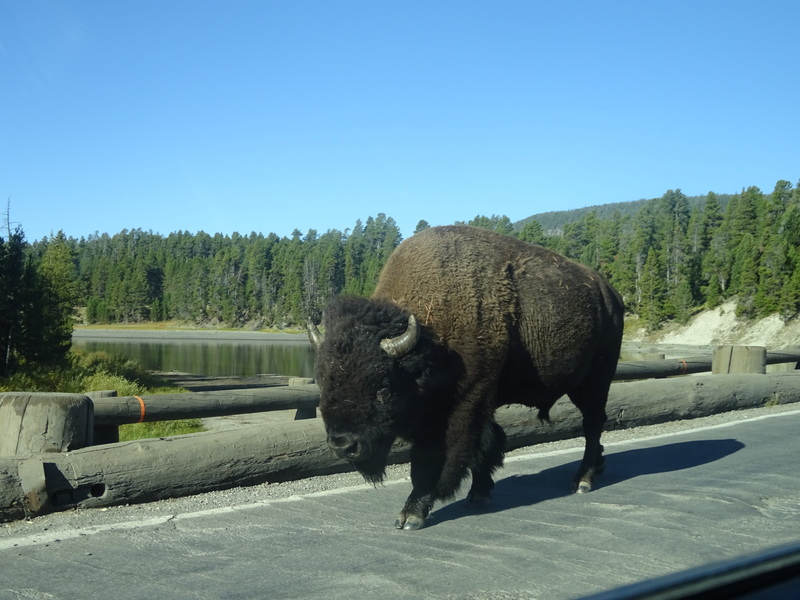 We saw Buffalo in the road near Fishing Bridge which was very cool. At Fishing Bridge we turned South to drive the Lower loop. West Thumb Geyser Basin sits on the shore of Yellowstone Lake with a boardwalk around the steaming volcanic vents and pools. It’s an atmospheric landscape and looks almost post-apocalyptic with dead trees and barren ground. The road to Old Faithful crosses the Continental Divide at Craigs Pass. 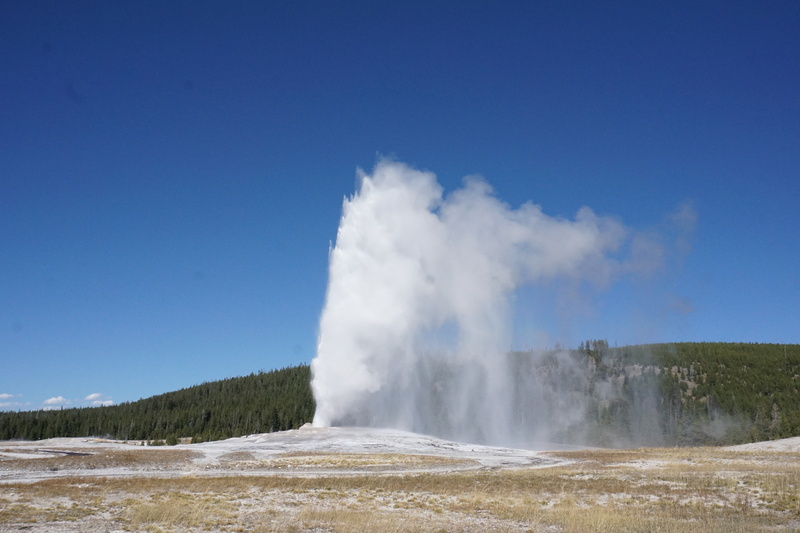 Old Faithful Park includes the Old Faithful Inn, The Visitors Education Centre and the Upper Geyser Basin. With over 150 geysers to walk around, it’s huge. The Old Faithful Inn is amazing to go look at and of course Old Faithful itself although this wasn’t our favourite geyser. 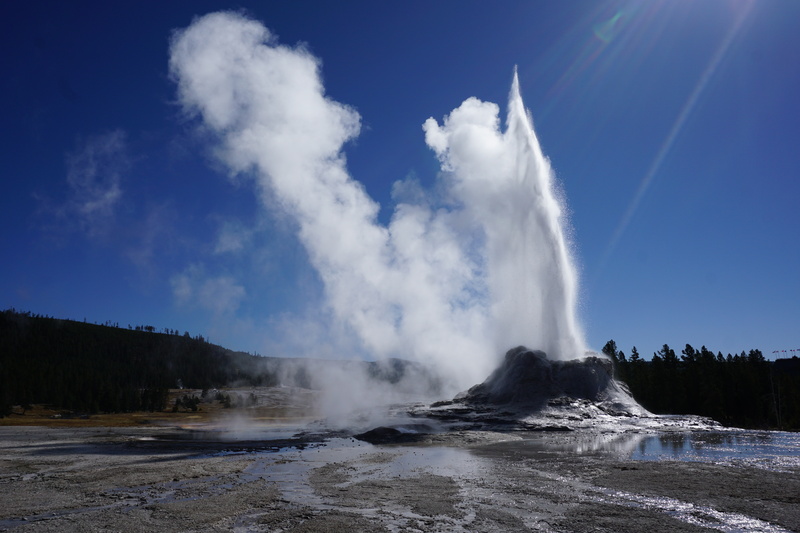 You can read all about our favourite geyser to watch here. 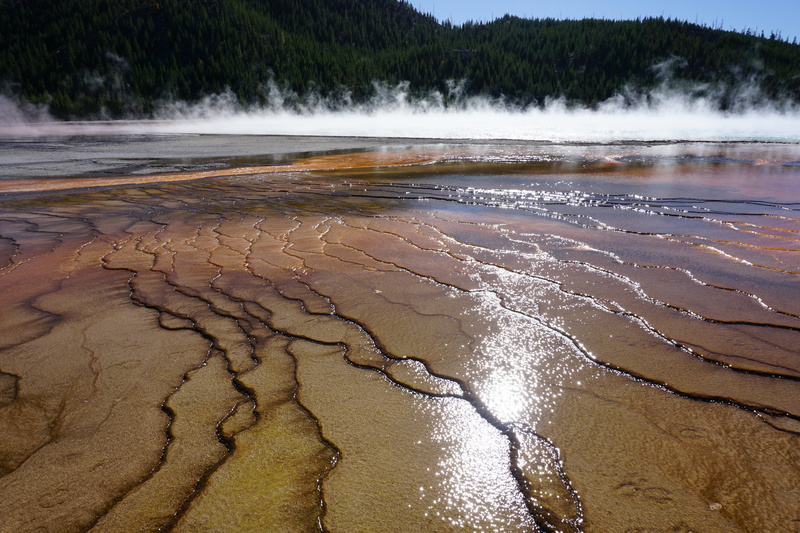 Following the road North, we came upon the Lower Geyser Basin and the Grand Prismatic Spring which is totally amazing. The clours of the Spring are astonishing especially from the viewpoint. 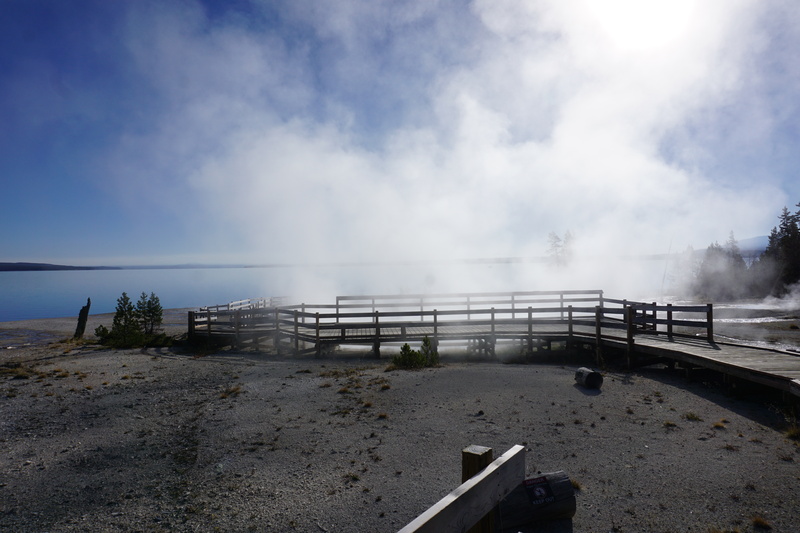 Following the Lower Loop, we headed North to the Norris Geyser Basin and then East to Canyon Village. We saw more Elk on the way which were right by the side of the road. A big drive South to the Yellowstone Lake and then West towards the East entrance where we came in earlier in the day. It was another long day of driving and we were glad to get a good nights sleep. We headed back into the park via the East entrance once again today. 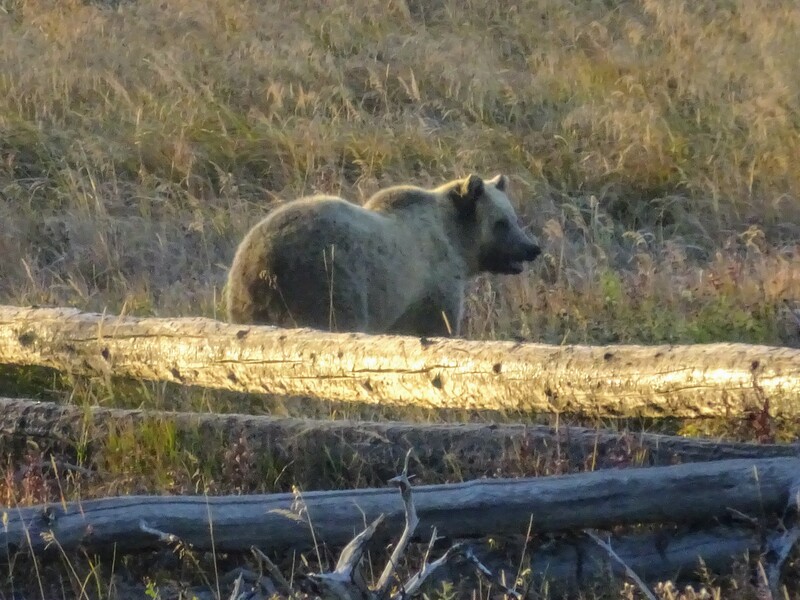 We saw two more Grizzly Bears near to Yellowstone Lake. A female foraging for food was then chased by a male across the road and up a hill on the other side. We watched for over an hour as the spectacle unfolded. What an amazing experience and on our last day in the park. At the West Thumb Geyser Basin, we continued South through the park heading for the South Entrance and The Grand Tetons. The road South out of Yellowstone National Park leads straight into Grand Teton National Park. 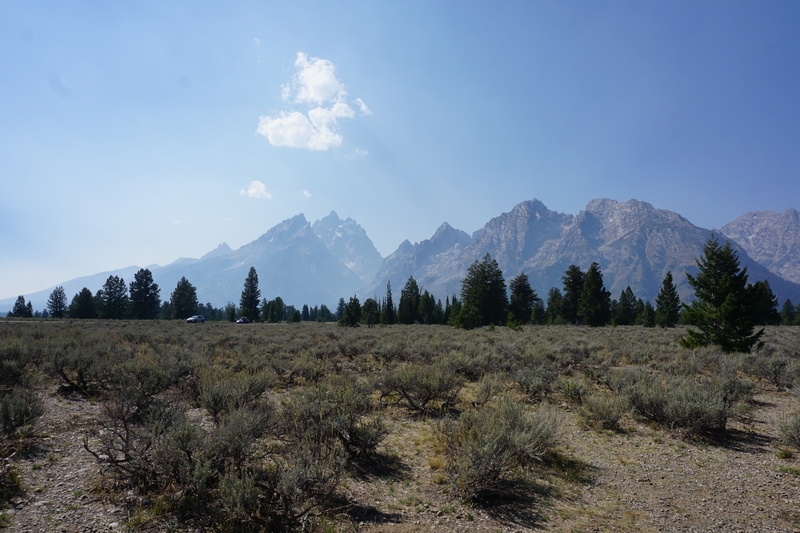 The landscape of the Tetons is very different from Yellowstone and as you drive down toward Jackson Lake you get your first view of the Grand Teton Mountain Range. Some big forest fires near Jackson made the visibility a bit smoky but the view of the Tetons is spectacular across Jackson Lake. 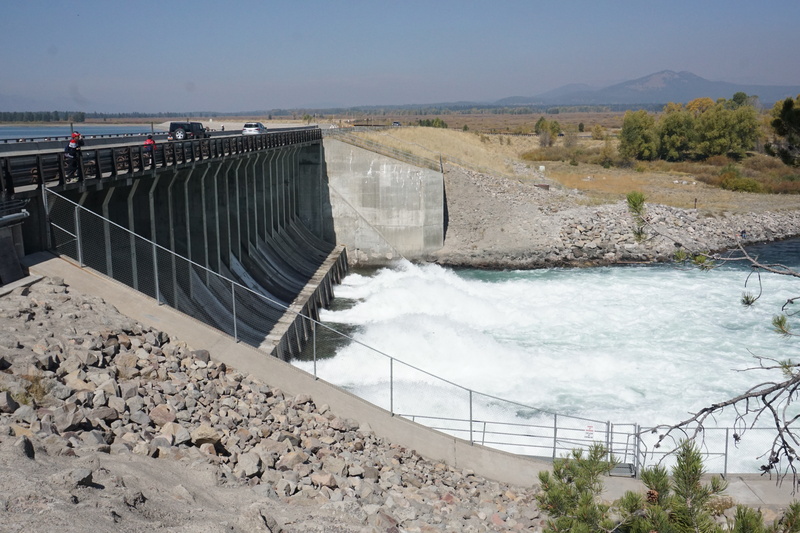 At the Southern end of Jackson Lake, the Teton Park Road crosses the Jackson Dam where water leaves the lake and flows into the Snake River. We carried on driving Southward through the beautiful ( if not hazy ) scenery of the park to eventually leave the park by its Southern entrance. You can see we packed lots into our few days in the park. The trouble is everything is so beautiful and there is so much wildlife to see that we just didn’t want to leave. Staying within the park would mean a lot less driving and more time in the park but as I said before the prices are very high and you do need to book over a year in advance. But if we were to visit again we would still stay outside the park. West Yellowstone looks like a good option for staying outside of the park but as it is closer than Cody, the prices are higher. 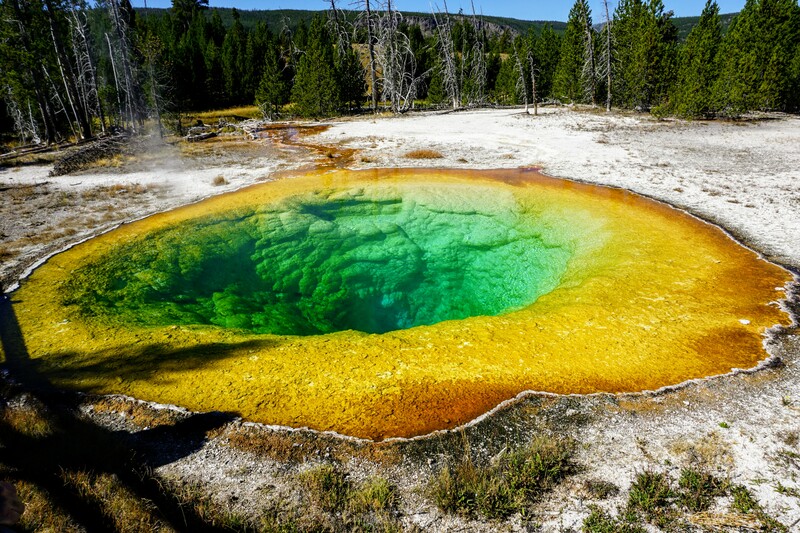 I’ve only given you a brief overview in the article but you can read much more about visiting Yellowstone National park here, including in-depth information on the attractions, where to eat, where to stay and when to visit. 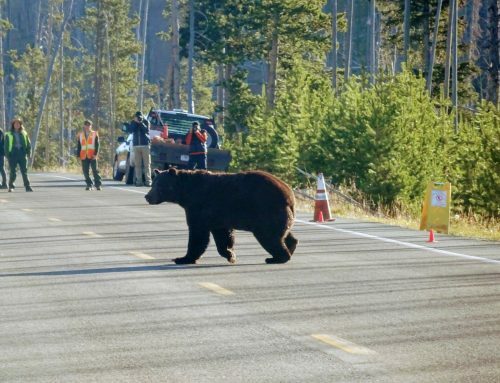 Oh and one more thing you have to do in Yellowstone National Park is make sure you have an adventure. After year’s we finally made it to the park and it was truly amazing. I don’t think there is anywhere else like it in the world.